This unique single story 2700 square foot home offers 5 bedrooms (2 masters), cable TV in 4 out of 5 bedrooms and a 46' Flat Panel TV in family room and FREE WIRELESS HIGH SPEED INTERNET CONNECTION, 3 bathrooms, fenced-in pool, whirlpool spa bathtub, 3 car garage, lavish landscape including palm trees and fruit trees, a granite kitchen counter top and a mix of both tile and carpet throughout. The over-sized master bedroom offers a King Size Bed, a huge bathroom with a sunken jacuzzi bath tub, double sinks, separate shower stall w/bench, toilet in its own room with a door and a very large walk-in closet. There is even a daybed in the master bedroom with a pop-up trundle to accommodate another 2 people on twin size mattresses. The second master bedroom offers a Queen Size Bed, its own bathroom and an over-sized closet. The Third and Fourth bedroom offer a Queen Size Bed and the Fifth bedroom has two Twin Size Beds. Every bedroom has a flat panel Smart TV (except for 1). Enjoy a barbecue on the natural infrared gas grill, under the covered porch (20' x 10') which is equipped with patio furniture and cooking utensils, followed by a swim in your own private pool (fenced-in, kid safe). This gorgeous corner lot is very secluded from the neighbors and offers a large lawn with exquisite landscape and fruit trees (seasonal). There is No Smoking allowed inside the home, but the covered porch lends itself to an after dinner beverage and smoke (cigar or cigarette). Pets are discretionary - call for approval. The kitchen is fully-equipped just like yours at home. There is a coffee maker, microwave, gas stove, 25 cubic foot refrigerator, dishwasher, reverse-osmosis drinking water system, double stainless steel sink with garbage disposal, all utensils, pots, pans, and cooking equipment, and a beautiful granite counter top. There is also a water softener and alarm system throughout the house. 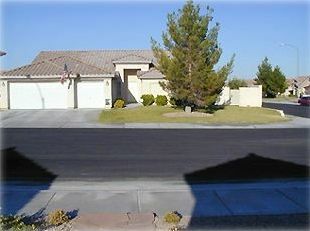 This dream home is located in the Northwest part of Las Vegas. It is just one mile from the 95 Freeway which will take you to the Famous Las Vegas Strip and McCarran Airport in just 10-15 minutes, Mount Charleston and Lee Canyon (ski resort) in just 20 minutes, Red Rock Canyon (hiking, rock climbing) in just 20 minutes, and the Hoover Dam in 40 minutes. Lake Mead offers boat rentals. Table and 6 chairs are on the covered patio. There are also 2 lounge chairs and 2 standard outdoor chairs. Lake Mead offers water sports gear to rent or buy. Las Vegas Ski and Snow Board Resort is approximately 30-45 minutes away. There are several nearby parks that have tennis courts. Plenty of great golf courses nearby. The house is sitting right next to 'Painted Desert' golf course and only minutes away from TPC and Badlands. Pool can be heated any time of year for a nominal fee. Located in Master Bathroom. This is a sunken Jacuzzi bath-tub. Ping-Pong, Knock-Hockey. Pool can be heated for a nominal fee. The house is clean, neat and orderly. Great location close to shopping. The pool was perfect for the kids. Adam was very helpful and responsive. We will definitely look up this location for our next Vegas trip. We had a wonderful experience at the house We were here for an 11u baseball tournament with four families and all of us enjoyed the house it was big enough for all 16 of us! The kids enjoyed swimming! And us parents enjoyed the relaxation! One week later and our families are still talking about it! We all look forward to staying here again!!! Adam was also really great to work with from the minute we left to go to vegas to our way back Adam kept in touch with us! Once again thank you so much, from Beaumont Bandits !!! Everything, and more, as advertised! This home was everything as advertised. What wasn't mentioned was the fantastic neighborhood. Quiet, clean and everyone was very friendly. Adam's quick responses to our questions were refreshing. The yard was perfect if you have a dog. Large fenced grass area. Perfect! There is no shortage of stores, grocery, retail, specialty in the immediate area, as well as the numerous restaurants nearby. Really enjoyed our stay! Thank you Adam. Thanks for bringing up those additional perks of where the house is located. It really is a nice area and neighborhood. Thanks for staying and I hope you see you again next year. I traveled with my 6 adult children. One of them is married with a son. There was plenty of room for everyone to have privacy and a bed. We enjoyed the kitchen where we made a full Thanksgiving meal with seating for everyone! The pool was not heated, so that was a little disappointing for some of the crowd, but overall a great time. Thanks again for staying at my Vegas vacation home. I am happy to hear that everyone enjoyed their Thanksgiving holiday and that you took full advantage of the fully stocked kitchen and seating capabilities. It is a shame that your party didn't take advantage of having the pool heated during your stay. It does take a good 24 hours to heat it up so it's always a good idea to let me know that you want the pool heated when you book your trip. Maybe next time. We had 9 adults and 3 children comfortably stay for 4 nights. Home is very large, beds are comfortable, A/C was flawless (105°+ each day) and swimming pool was perfect. Family loved the pool table/Ping Pong combo! The patio and furniture was large enough for all of us to enjoy the space while the gas bbq cooked our food perfectly. I had to contact owner (Adam) a few times that had no bearing on our stay (sprinkler system) and he was quick to respond and provide the needed information. Home is approximately 15 minutes from LV strip (out of towner time) and we used UBER with no problems. We will definitely stay if we return to LV and will recommend to family and friends. I'm happy to hear that everyone loved the house. It is great to hear consistently from all my vacationers that the trip to the strip is short and that they loved the amenities of the pool, BBQ and Ping Pong table. Also, since I'm in the furniture business I try hard to change out the mattresses often with high quality Sealy and Stearns and Foster mattresses. If you liked them enough you can buy yourself one at BedPlanet.com. I hope to see you back when you're in town next. This is the second time I've been inside this house. Thanks Adam for taking my request for class reunion. My classmates enjoyed every minute of your house. *Rate may be higher during certain holidays and events.